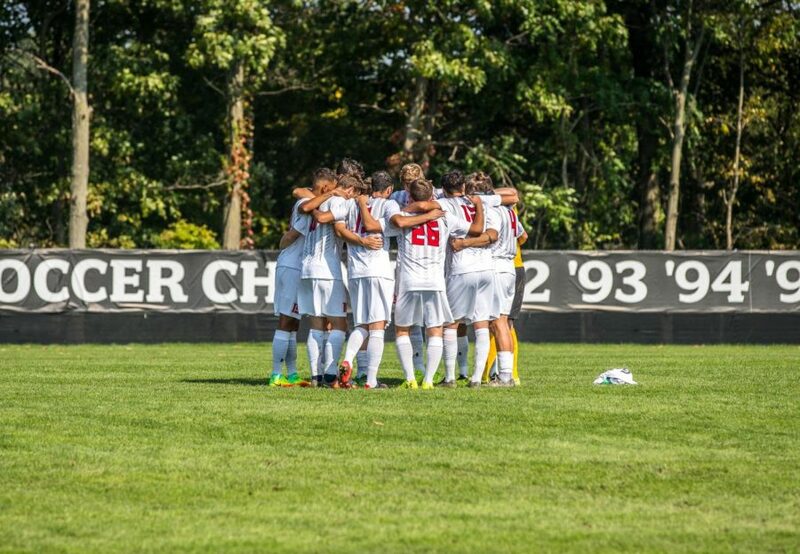 MOON TOWNSHIP— The Robert Morris Colonials men’s soccer team (4-10-1, 2-4-0 NEC) played host to Central Connecticut State University Blue Devils (1-11-1, 1-5-0 NEC) on Sunday. With the players keeping warm, the Colonials played for a spot in the Northeast Conference playoffs. It didn’t take long for the game to get started with the first corner kick by RMU’s midfielder Lorenzo Guagneli. While unsuccessful, it was a theme throughout the day as the Colonials created chances, but couldn’t finish. From the first half, Dan Labella of CCSU sent the ball over his head which sends the ball back into the box. The ball then was directed by Larson which was followed by Fondi diving in for a save to his left in the 31st-minute. After 45 minutes, neither team scored resulting in the final 30 seconds of the Blue Devils goalie, Carson D’Ambrosio, kicking in the right side to end the first half. Even though the score was 0-0, Robert Morris led in shots 7-3. In the second half, many yellow cards were handed to both teams. In addition, CCSU scored the first goal of the game in the 60th-minute by Louis Beddouri, assisted by Larson Richards. At three minutes left in the game, Riccardo Rota, the shot leader at the time, was subbed out for Critistian Palermo after Rota received a yellow card. Quentin Lux of CCSU was also handed a yellow card giving Pearce Fanck a free kick. The free kick was headed by a pair of Colonials before a hand-ball on Carson was called with 1:32 remaining. “You know, I think shots can sometimes be misleading which the real stats should be quality chances and there’s two or three a game and hope you get all three of them but that wasn’t for us today,” said coach Denniston. The clock was then stopped and a shot taken by Fanck almost went in, but offsides was called on the Colonials with 1:25 left in the match. CCSU kicked the ball down the field and another free-kick for RMU was taken by Pearce but he sent it in away from everyone. That was the final moment of the game and the final score was 1-0 in favor of Blue Devils. The Colonials had a total of 18 shot attempts in the match, it was a tough game for Robert Morris. The Colonials will be playing again on Friday. At Friday’s game, the Colonials will be kicking off at 7 p.m. at Mount St. Mary’s University (2-8-3, 1-3-1 NEC) in Emmitsburg, Md.